Bundesliga | Bayern Munich goalkeeper Sven Ulreich on Real Madrid blunder: "I had two thoughts - I just didn't choose correctly"
Bayern Munich goalkeeper Sven Ulreich on Real Madrid blunder: "I had two thoughts - I just didn't choose correctly"
It's a mistake that will probably haunt him for the rest of his life, and now the man himself, Sven Ulreich has attempted to explain his uncharacteristic blunder in Bayern Munich's agonising UEFA Champions League semi-final exit at the hands of holders Real Madrid. With the score finely poised at 1-1 on the night and Bayern needing one more goal to force extra-time, the 29-year-old goalkeeper experienced what coach Jupp Heynckes later described as "a mini blackout". Dropping to the turf to collect a short back-pass from Corentin Tolisso less than a minute into the second half, Ulreich realised he couldn't handle the ball. His attempts to rectify the situation with an improvised sliding clearance failed, allowing Karim Benzema to poke home and give Real the lead, which, despite a leveller through Madrid loanee James Rodriguez, was crucial in sending the Bundesliga champions out. “Then I wanted to clear it with my feet, but I couldn’t adjust. And then couldn’t save it with my hand again either. It all happened in the space of milliseconds. I had two thoughts - I just didn’t choose correctly." 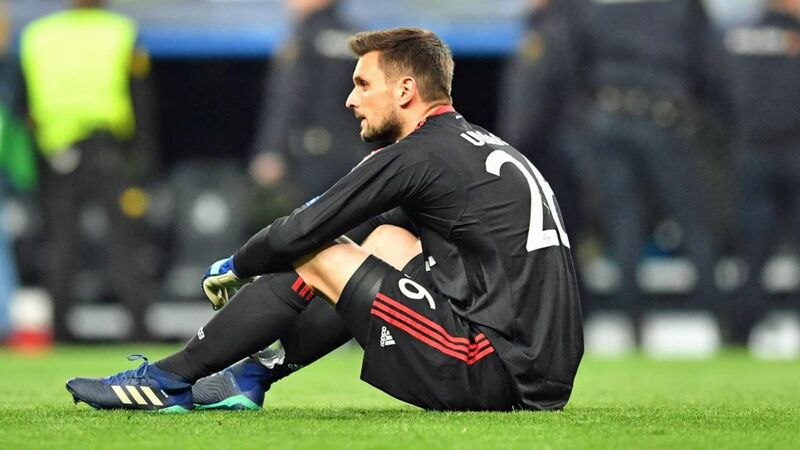 "Words cannot describe how disappointed I am about us being knocked out of the Champions League," Ulreich wrote on his official Instagram page after the game “We really wanted to reach the final, we gave it our best and then I made the unnecessary error. I can't explain it. I'm sorry… to my team and to our fans." A number of Bayern players responded with messages of support, while Thomas Müller was quick to deflect blame away from Ulreich, saying in his post-match interview: "Mistakes happen, no one's blaming anyone. We had chances to cancel it out." Ulreich's error, which has been likened on social media to a FIFA gaming glitch, detracts from an otherwise exceptional season for the Bayern No.2. Watch: Sven Ulreich's best Bundesliga saves! “If you make a mistake as a striker, it's not that bad. As a centre-back it’s a little worse and the goalkeeper is usually the same level. You can’t make mistakes. I haven’t done in eight months, now this one. It's a pity it happened now." Deputising for the injured Manuel Neuer, the former VfB Stuttgart custodian has turned out 44 times in all competitions, helping Bayern to a record sixth successive Bundesliga title and reach the DFB Cup final, where the Bavarians will face Eintracht Frankfurt for the chance to a complete a domestic double on 19 May.